This is old news by now, as I’ve been a little bit backlogged on some bloggage, but oh well. 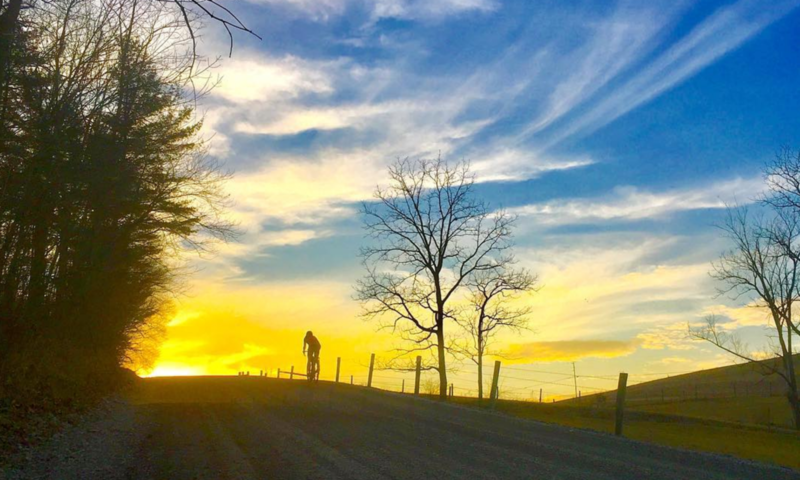 A few weeks ago I spent a few days camping, riding, and hanging out with folks from Bicycle Times magazine, who were in the area to do recon and gather promo footage for Adventure Fest, another cool cycling event coming to Raystown next fall. I had to work during the day for much of the recon trip, but was able to join in on the fun around the campfire in the evenings, and for the riding and filming on Friday. Basically, the riding involved going back and forth over the same spot multiple times, sometimes in pairs, sometimes in small groups, sometimes as a large pack. Meanwhile, out photographers, Justin and Jon, shot pictures and video. We began at the top of Williamsburg Mountain, where the temperature seemed to be 15 degrees colder than at camp and a cold wind blew. Most of us stood around freezing in our Lycra while we got ready for the photo shoot, then decided to do laps up and down the road to keep warm. The first series of shots was of a group of us riding down the mountain, following the van from which Justin and Jon were filming. I love riding down Williamsburg Mountain—such a thrilling ride! And it was fun to be able to share that experience with the BT crew. This barn kitty found a new home with Emily. At the bottom of the mountain, a little grey tiger-striped kitten ran up to us out of the barn we were milling around. The friendly, furry creature was passed around for ample hugs and cuddles before we started heading back up the mountain for some riding-uphill shots. Emily and Justin ended up coming back and adopting this kitty and one of its siblings at the end of the weekend on their way back to Pittsburgh. From Williamsburg Mountain, we headed to a couple other scenic locations—a bridge above Raystown Lake, and some beautiful back roads. The sun came out and the cold disappeared, and it ended up being a gorgeous day despite its windy, chilly beginnings. We rode bikes and shot footage until late afternoon, then headed back to camp for some paddleboarding, beer, and Elizabeth’s famous pizza. It was a great couple days of getting to know the Bicycle Times folks better. I’ll be sure to post the video when it’s released. Ride, film, repeat. And rock that plaid. These two had a little weekend Bromance going on. Previous PostPrevious Hawkwatch to Greenwood. Next PostNext Around the lake…almost.